What value is there in a pilgrimage to an allegedly “holy” place? And what makes it holy, exactly? If God is everywhere, can he really be found in higher doses in one place vs. another? In Europe the notion of pilgrimage is hard-wired into the culture, and one of the most popular destinations is Lourdes, France. 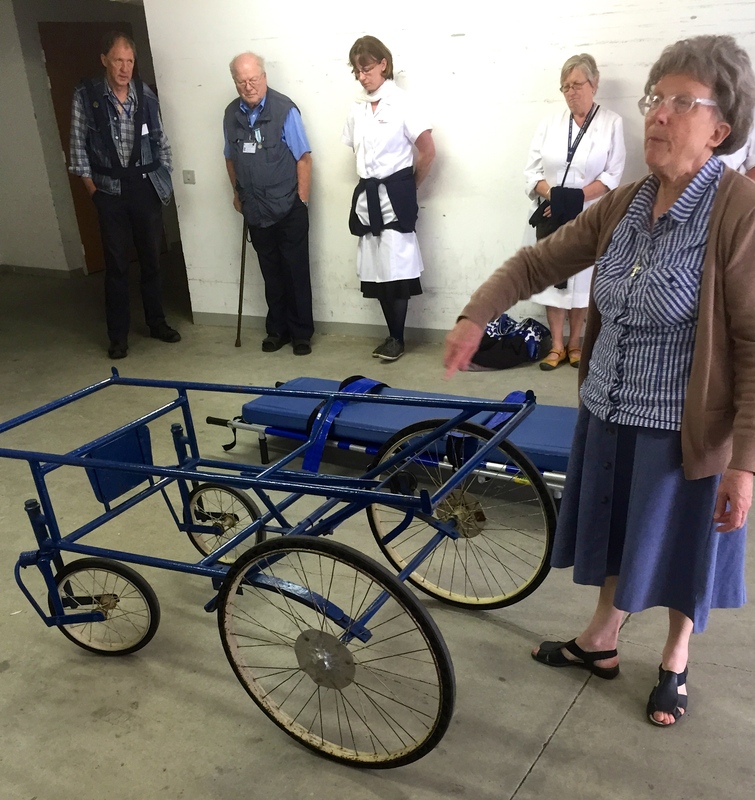 I spent 8 days there this summer as a volunteer with the Society de St Joseph, a lay group charged with helping transport elderly, sick and disabled pilgrims from the train station to their lodging, and assisting in the baths (more on those later). I figured that by serving the seekers, maybe I’d find something too. In 1858, a young peasant girl named Bernadette Soubirous (later Saint Bernadette) saw an apparition of a beautiful woman in blue in a cave (or grotto). Over the next five months, she saw her 18 times. The woman spoke to her, and only her, with a message that remained consistent: Repent from sin, pray, fast, believe and follow Jesus. 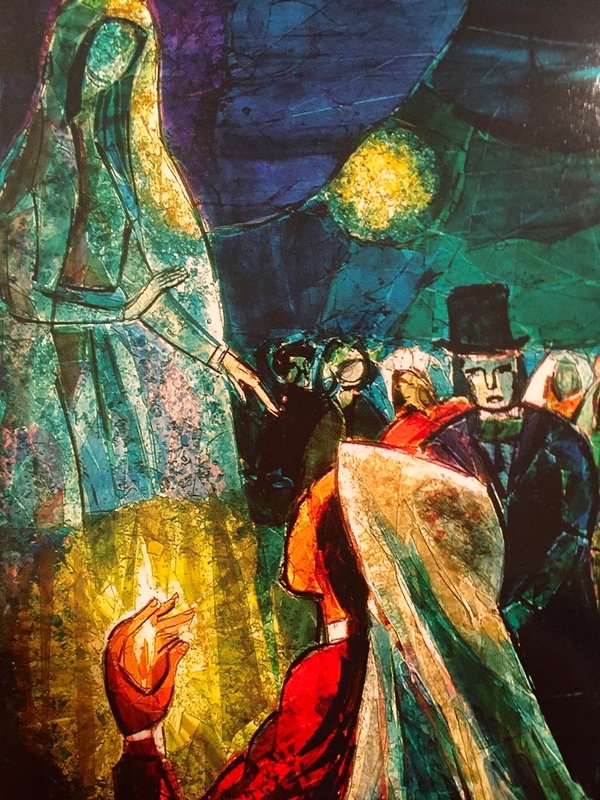 Initially, Bernadette’s visions were met with disbelief and derision, but soon miracles began occurring in the waters of a spring she uncovered near the apparition. The lady in blue was later determined by believers to be the Virgin Mary, and the result was an avalanche of pilgrims and seekers converging on this tiny town in the Pyrenees. 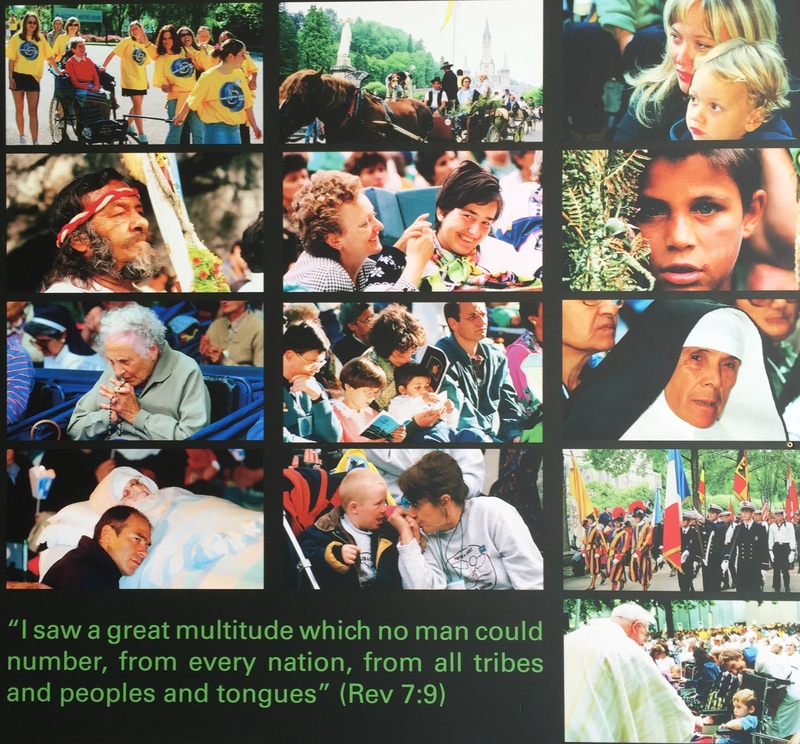 Since 1858 it is estimated that 200 million people have visited Lourdes, and today, between 4-6 million travel there every year in search of healing, peace, and God. It has been called a Catholic Disneyland, and Walt Disney may have indeed borrowed the design of this beautiful church for his castle in Orlando. But I did not find rides and amusements, only earnest seekers from every corner of the globe. 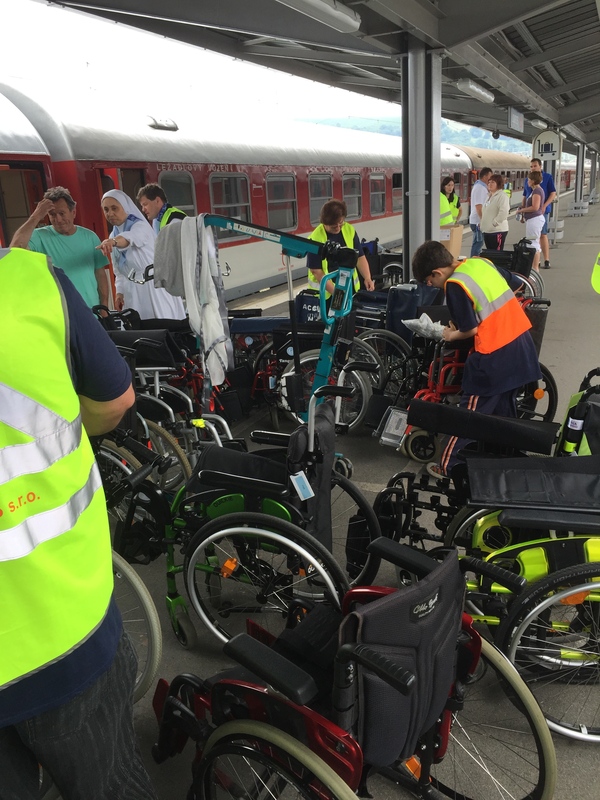 And so many sick and suffering – frankly, I was astonished some of them left home, much less made the difficult trek to a tiny, decidedly non handicap-accessible village in the South of France. In Lourdes, the water is omnipresent. The Gave de Pau River rushes through town and runs adjacent to the grotto and Lourdes Sanctuary, a roughly 120 acre expanse of walking paths, churches, and prayer areas. The river also serves as a demarcation line for the commercialized shops and restaurants of Lourdes proper. There is nothing to buy once you cross the Gave except candles, and these are purchased on the honor system by placing money in a locked steel box. There are several churches – one built underground and capable of seating 20,000 people, the baths, two enormous “hospitals” built to house the visiting sick and infirm, beautifully manicured grounds, and Bernadette’s Spring, where the water still flows and the faithful fill their jugs 24/7 to bring home to family and friends. The springs feed the baths, where every year hundreds of thousands of perfectly sane people strip down to their birthday suits and are discretely (and somehow without feeling compromised) wrapped in a soft towel and gently encouraged to make a “trust fall” backwards into the cold water. The bathers say short prayers with their personal intentions prior to being dunked, and often a Hail Mary asking the Virgin Mother to pray for their families. 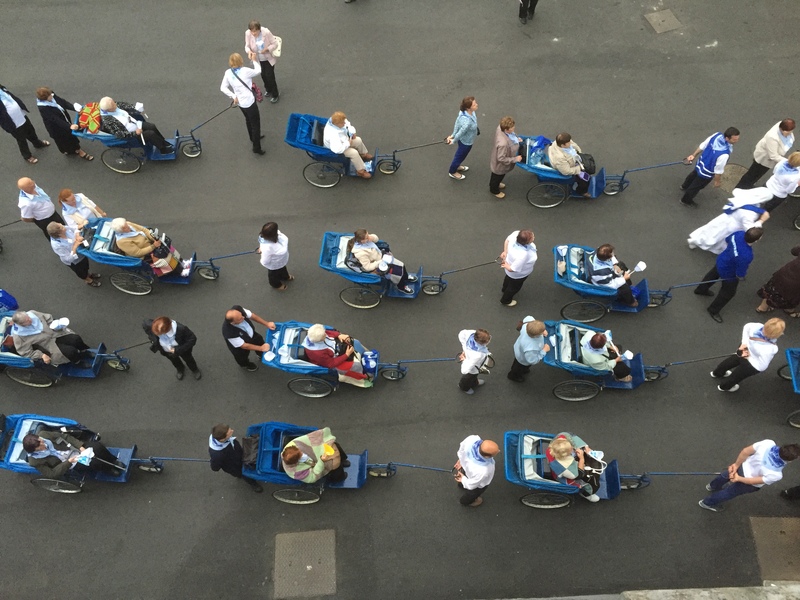 The sick and suffering are the stars in Lourdes – here they are literally lifted up and celebrated. There is a full-time staff of 500, but nearly 5000 volunteers are required each week to accommodate the crush of visitors, sick and handicapped. Many come every year for a week or two, and I met several who have been volunteering for 20, 30, and even 40 years. One English gentleman who became my unofficial “Lourdes mentor” has been coming since his junior year at Oxford, some 59 years ago. After a half day of training, my job was to help the elderly and handicapped get from the train to a waiting bus for the short drive to their on campus hospitals. From an organizational perspective this is a minor miracle in itself. 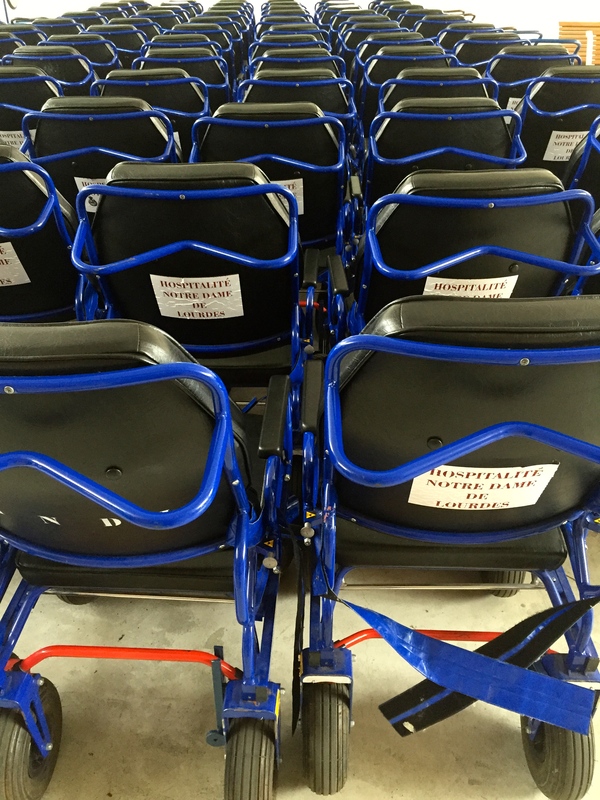 Every week, thousands of sick pilgrims – paraplegics, the morbidly obese, ALS, cancer, MS sufferers, etc. arrive in Lourdes after 15+ hour train rides expecting to be greeted by “somebody.” There are no computerized master schedules to ensure X volunteers are in place to handle Y pilgrims. Instead, it is a well-meaning hodge-podge of volunteers speaking 6 different languages trying to communicate with each other, often unsuccessfully. (In my team alone we had a Ukrainian, French, Italian, Ecuadorian, Australian and South Korean.) The sick arrive by trains in groups but many are travelling alone. They arrive knowing they will be transported to the hospital, fed, bathed, taken care of for the duration, first in line to every event and function, and pushed in wheelchairs or stretchers (circa World War 1) by strangers who treat them like long lost family. It is beautiful, but not seamless. On one occasion an Italian engineer friend of mine, Giacomo, was helping me wheelchair pilgrims from the train to a waiting area for their bus to the hospital. He left Italy to work in England, his engineer sensibilities frustrated by the disorganized chaos that is Italian politics, business and life in general. It was brutally hot, and the pilgrims had just completed a 20-hour train ride from Slovakia but the busses were nowhere in sight. As the sick, elderly and handicapped waited in the humidity, he began to get frantic. Nobody seemed to know when the busses would arrive, and communications were non-existent. A sick pilgrim who looked to be in his eighties saw Giacomo’s frustration and decided to diffuse the situation. His couldn’t speak, perhaps due to his condition, so he began loudly humming “Amazing Grace.” The hundreds of people waiting for busses quieted to hear him, and soon smiles started breaking out – frustration and inconvenience were not new to any of them. Mid-song an elderly woman started yelling and beating a tattered carry bag in her lap. At first I thought she was having a health issue, but the bag had the Virgin Mary’s face on it and a Lourdes insignia. 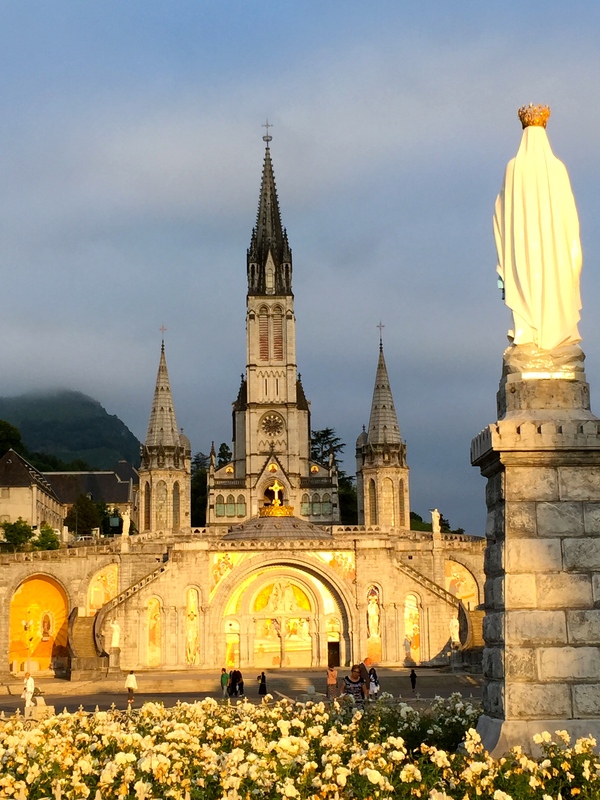 She wasn’t upset, but ecstatic – she had made it back to Lourdes! The next day I was transferred to the baths, and after 15 minutes of training pressed into service. My job was in the “pre-bath” staging area, a small curtained room where the men undress prior to being dunked. Here eight men of all shapes, sizes and nationalities sat, none of whom spoke English, and my job was to tell them to strip to their underwear. A few had done this before and politely smiled at my hand signals and gyrations. They began to undress, and the others followed. Many had traveled thousands of miles for this experience and there was an air of anxious anticipation in the room. As I tried not to look around, I couldn’t help but become distracted by the effects of age and gravity on the human body. This was quickly dispelled as the men emerged from the baths smiling and got dressed – they were universally happy. I didn’t see any miracle cures, but this act of submission and faith unlocked “something.” You could see it in their eyes. Next, a man brought in his 20-something paraplegic son. The young fellow was 6 feet tall, over 200 pounds and could not speak. Seeing my panic a Lourdes veteran came to assist me, and we emptied the room and began the process of helping the father prepare his son. I watched the tender way he undressed him, and tried to imagine their life together – the countless difficulties, and the extraordinary love. The father had clearly decided that his son was going to experience life to the fullest, and that included going into the baths at Lourdes. After 30 minutes of preparation six of us gently lifted him into the cold water. He let out a yelp, and then relaxed as the father held his hand and prayed over him. We got the young man dressed and back in his wheelchair, and the father took his own bath. He too let out a yell as he immersed himself, and this bit of retribution seemed to please his son. Every night in Lourdes there is a candlelight procession, led by the sick. With the sound of the rushing Gave in the background, the procession winds around the immense grounds with tens of thousands singing and praying together. The mood is somehow both somber and celebratory, with the European contingents carrying the colorful banners and flags their families have carried for generations. Together they prayed for the sick and suffering in the world, and for their families and communities. After several nights as an observer I finally decided to join the procession. Soon I was swept up in a sea of strangers, and we were walking and praying together like old friends. I was struck by the realization that all of us had been propelled here by something we could not see. God is everywhere, but sometimes (and in some places) we are a whole lot more receptive to Him. Lourdes is that kind of place. In regards to the idea of pilgrimage, he was more circumspect. Blood, Soul and Divinity really pretty much does it. And then oftentimes it is just being in the presence of brothers and sisters in Christ here at home or on mission. I hope to visit Kibeho someday with you – I imagine all these places are unique in their own special ways. 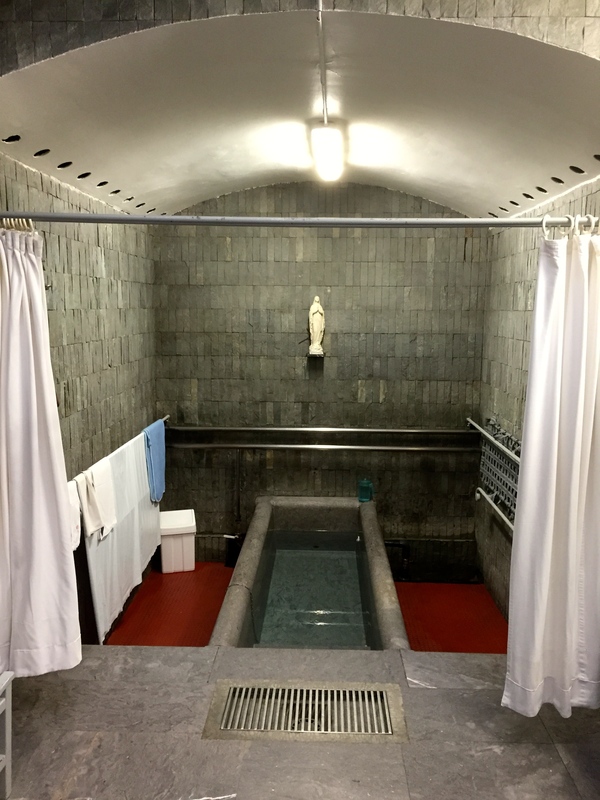 The priest you met from Ireland succinctly expressed what I’ve been feeling since my pilgrimage to Lourdes: “‘I’ve never been able to explain it to someone who hasn’t been here,’ he said, ‘but Lourdes is like a big spiritual washing machine. We arrive dirty, and somehow leave feeling clean.’” Even now I have a hard time appreciating or even understanding all that happened to me at Lourdes but your reflections here have given me some real opportunities to revisit my trip and unpack it in all in prayer. I can certainly understand why it took you six months to post your reflection! It did take awhile to unpack this. Life got in the way, of course, but it is such a big place and big experience I didn’t know where to start. In the end though, the “headline” of Lourdes for me is the way the sick and marginalized are made to feel like kings and queens. Just so beautiful to see and feel. This is so beautiful and thoughtful and I do not say this because you’re my husband. We can make a pilgrimage anywhere and in many ways our whole life is one. But I highly encourage an intentional one where you can truly focus (so hard these days) on loving God and neighbor as well as letting our Father love you back. Hi MJ – thanks for the kind words and glad you liked it. You should go to Lourdes! I am so thrilled to finally hear of your Lourdes experience. You were truly blessed to make this pilgrimage and we too are blessed to “experience” it through you. Thank you for sharing. God is good. Great article. I have heard the story of St. Bernadette from a book and watched the story on T.V but I have never heard anybody actually having an experience at Lourdes. This was very refreshing and gives me a better understanding of what the story is all about.